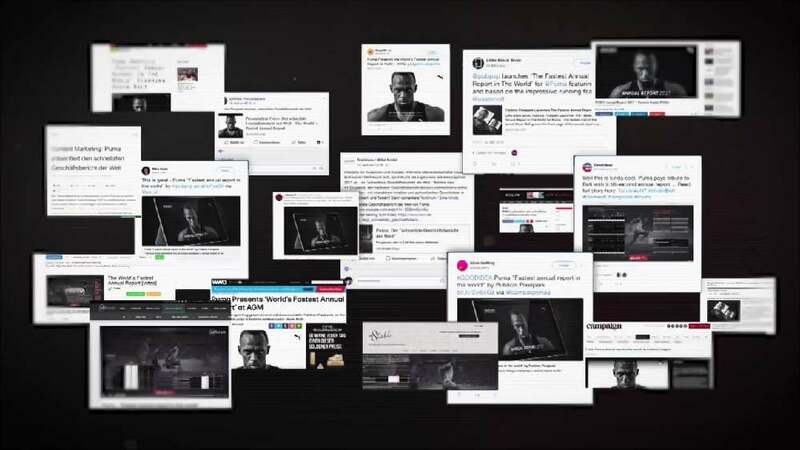 “The world’s fastest annual report” was created as a tribute to the world’s fastest man – with a 9.58-second film featuring athletics legend Usain Bolt at its technological and creative heart. Both the film and the print edition of the 2017 annual report convey PUMA’s corporate mission statement “Forever Faster”. The film is based on Usain Bolt’s world record race from 2009. Thus, the annual report’s entire content has been laid over his run in 240 single frames, matching the 9.58 seconds of the record run. The viewer is able to navigate back and forth, stop and read, all the while watching how Usain Bolt races toward his victory. The film was converted to black and white to further underline the historical significance of this run. Specific markers make it possible to directly jump from the film into the corresponding chapters on the microsite. Just like the print edition, the microsite only uses red as an additional colour within an overall clear and vivid layout. Reflecting the company’s motto – and that of racing sports, where every second counts – no time is lost on fancy embellishment. The annual report for PUMA fascinates with the outstanding idea of implementing the brand mission statement of “being fast” in a creative manner. Using the world record run to illustrate the annual figures and facts of a sporting goods manufacturer truly hits the nail on the head, making all content a pleasure to explore. The print edition also convinces with stringency, inviting and piquing interest with its distinctive cover picture to get to know more.